May is warm colors and bright flowers and more sunshine as every day grows longer, and my May 2017 Feline Sampler welcomes the outdoors in a vase of flowers, through the windows and in the garden. Click each photo to see an enlarged version. 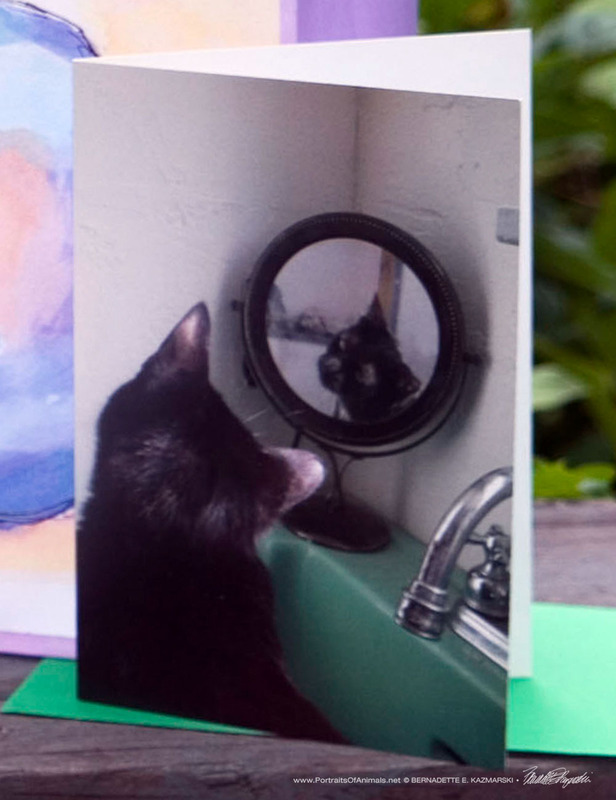 “I Like Your Spots” note card from Kitties Being Kitties. The Perfect Place fine art card from In the Garden. 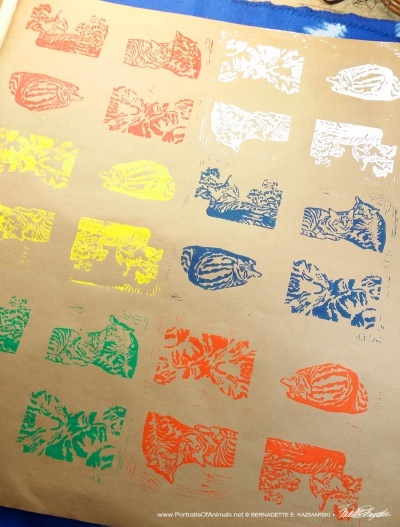 “Tabbies”, Primaries hand-printed wrapping paper. It’s the first day of spring and a gorgeous morning. Mimi waits by the door, keeping an eye on me over her shoulder so I don’t wander from the kitchen and forget the importance of getting outside before the busy part of the day begins. It’s a position and an expression I see on her face most days, even cold or inclement ones, and I also saw Cookie and Namir and Kublai in the same position with the same expression at the same back door, waiting to go out on the same deck into very similar sunny mornings. Even though I painted this in March I still wanted to include the painting in a sampler box, and April just had to be Two Cats After van Gogh. Besides, Mimi does this every day. The print is 8” x 11″ and I’ve matted it with a buttery pale yellow to fit into an 11″ x 14″ frame. This matted version is only available in my sampler boxes, but you can request it if you’d like one. You can also find “We’re Going Outside, Right?” in my gallery of feline artwork. “Oh, thank you,” said Mr. Sunshine as he happily squinted and stepped into the pile of socks I was sorting and folding. “This is just…so nice…purrrrfect,” he said as he began purring loudly and kneading slowly and thoughtfully with both front paws. 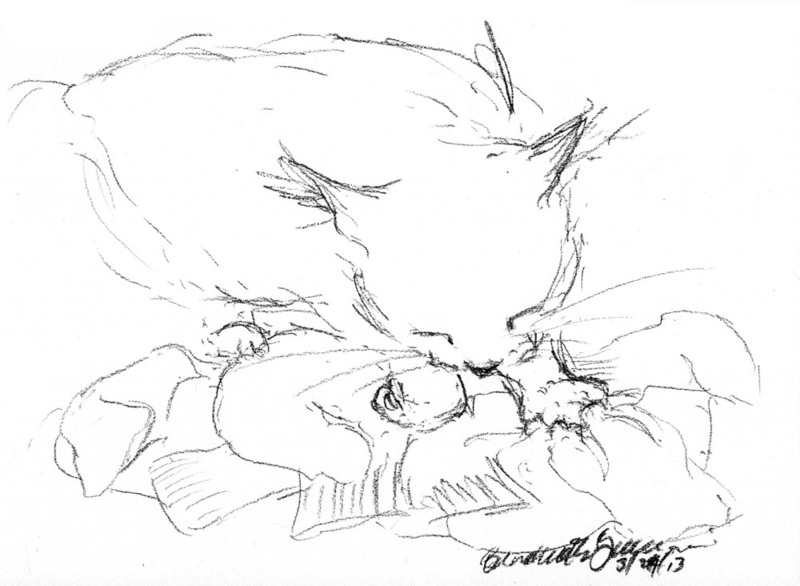 Cats and laundry just go together as if the laundry basket had a little bell on it that only cats could hear. Finishing with the socks was out of the question right then, so I sketched him, from my angle, foreshortened, looking down on his happy face, relaxed ears, closed eyes and starfish paws. 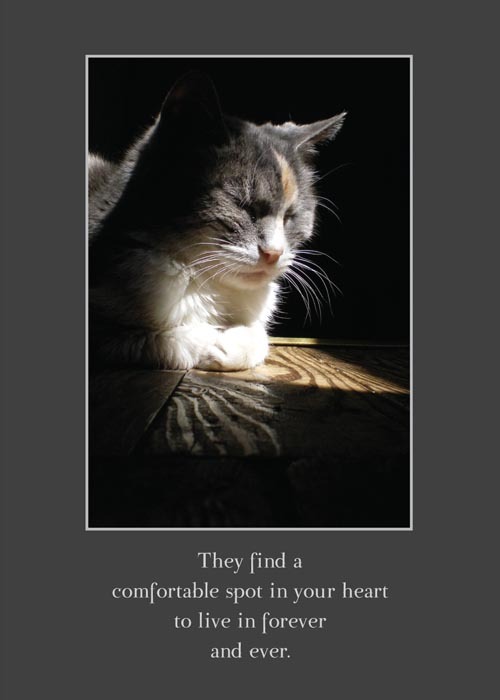 The sympathy card for this month features Peaches in Peaches Naps in the Sun, another image of Peaches in the sun in the spring. 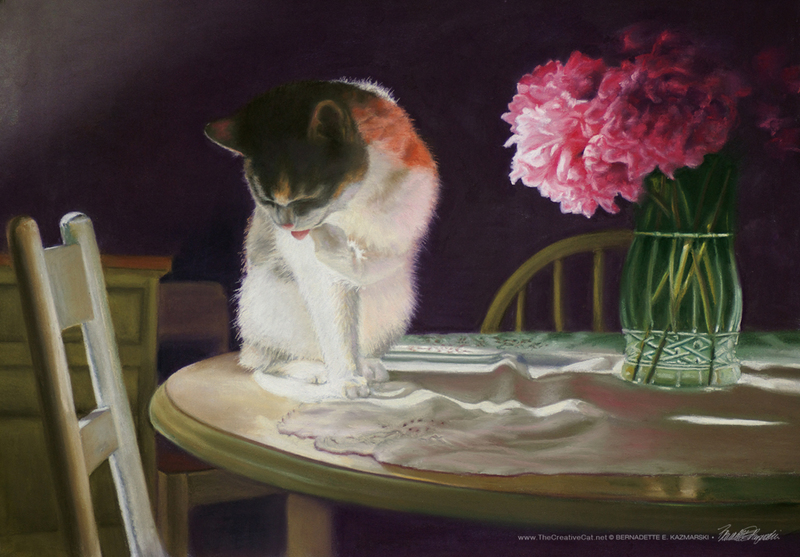 She makes another appearance on this month’s art card in “Peaches and Peonies” because the reference photos for this painting were taken in May, and I wanted to include the colors in this month’s sampler box. “Gosh, I’m Cute” is an oldie but a goodie and I just wanted both that sweet cuteness and that shade of green in the palette this month. This month’s note card is an ink sketch from way back when I first began sketching, I Like Your Spots, included in the “Kitties Being Kitties” set. 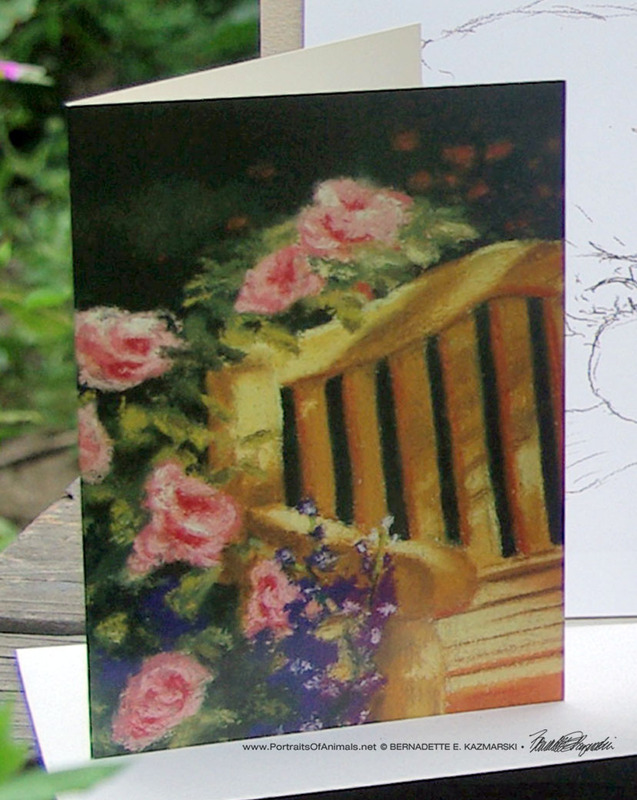 I needed some other coat patterns included this month, and the cards are printed on a creamy ivory stock too. 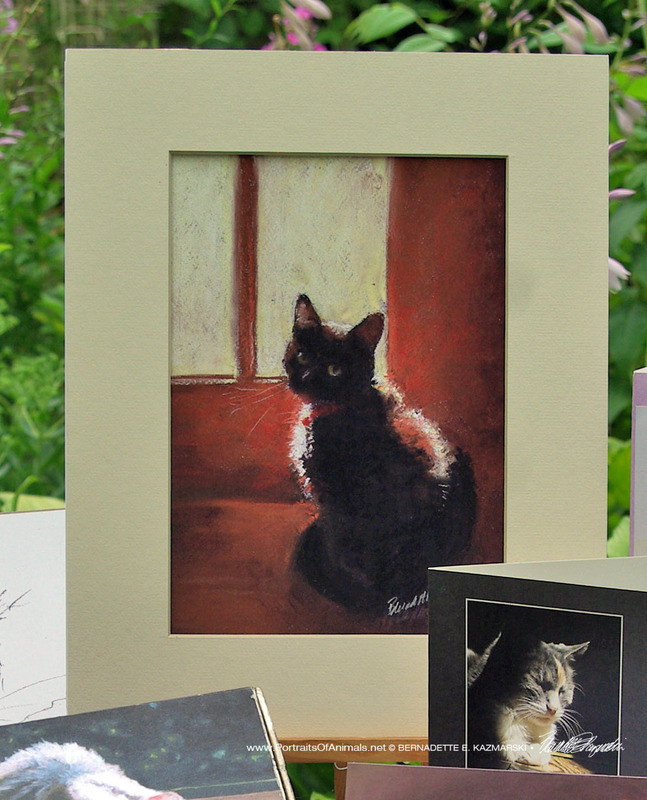 This month’s non-feline card is The Perfect Place from my In the Garden fine art greeting cards collection. I know many people garden or enjoy the outdoors and this painting was inspired by finding one of those perfect quiet spots to spend a few minutes and just “be”. I’ve begun including gift bags in each of my gift boxes as well so you can get a closer look a them. This bag is World Cat, but each sampler box will get a different bag depending on my arbitrary choice. Sometimes it’s fun to just let it happen and not plan every little detail! I went with “Tabbies” again for my May sampler box. I’ve printed “Tabbies” as note cards and a few times on textiles, but this year I decided it would be a natural for wrapping paper. 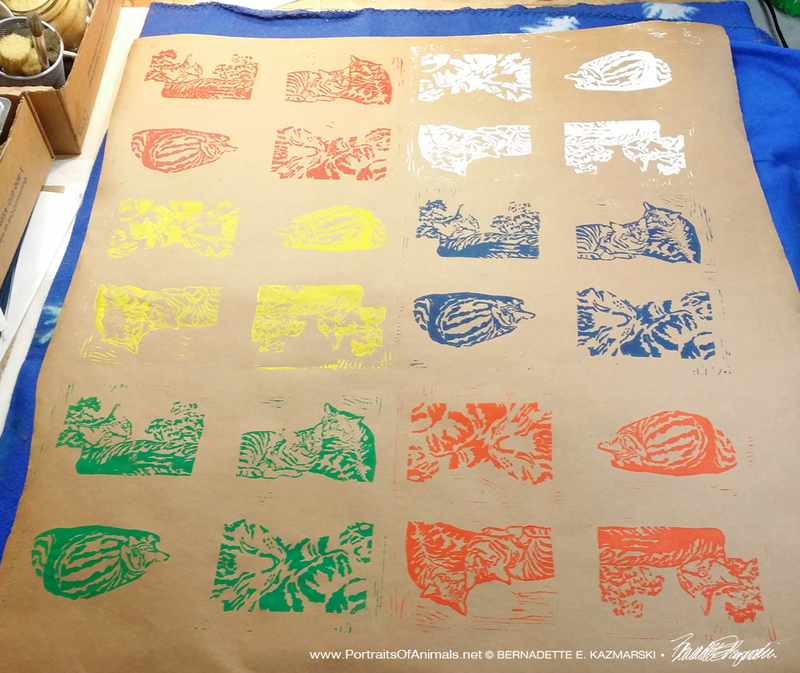 It is a linoleum block print which, when I cut the block, has all four designs on one block. Each sheet of paper is hand-printed on 100# Kraft paper, about 24″ x 30″. I cut a sheet in half to wrap each of this month’s sampler boxes. I can tell you right now that I can finally justify getting a roll of white butcher paper to print on, and I have several other ideas for printing this design on paper, some of which you’ll see in upcoming sampler boxes. 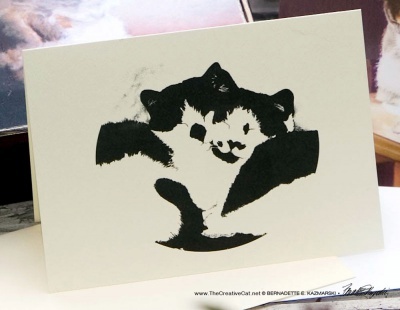 I use as many environmentally friendly and fully non-toxic materials as possible in my packaging so I use as much recyclable paper as possible, which includes the glassine bag holding your cards. 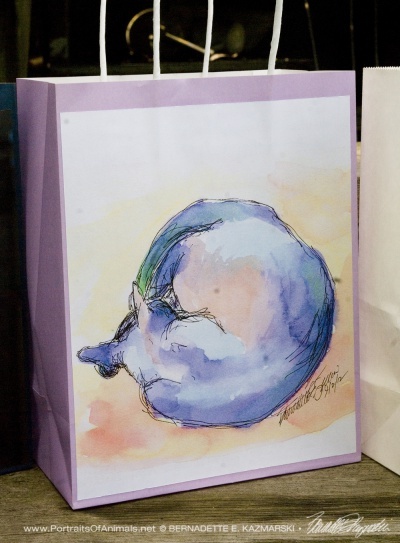 However, on the chance that you may donate or give one of your prints as gift, they are packed in a clear print bag or cellophane wrap depending on their size, and this is not recyclable but you may be able to reuse it. I both recycle any packaging I get that is clean and reusable, and use as many recyclable materials as possible. Read more here. 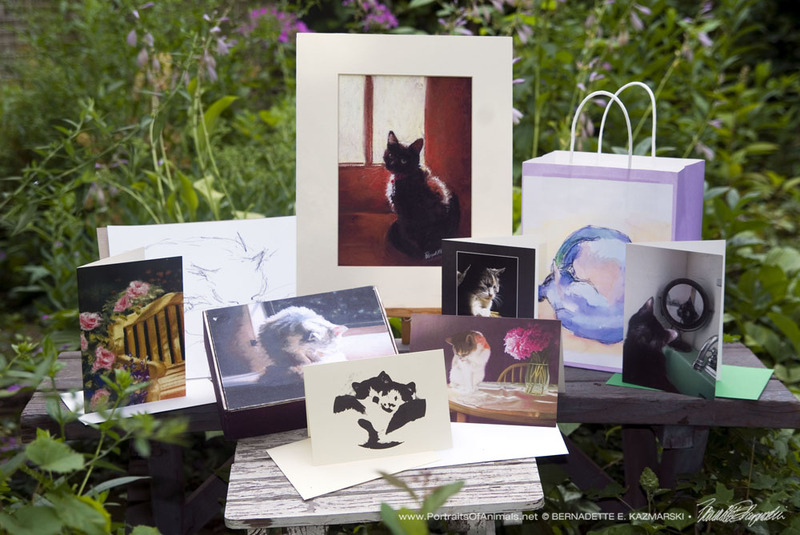 You can purchase any prior Feline Sampler Box. When I send them originally I put together as many as were ordered, but unless I am completely out of a special handmade item I usually have all the contents here in my studio, though I do have to cut new mats for the artwork and print the wrapping paper. They cost a little more than the original because the extra time it takes to put one together, and when I ship several similar packages at once I get a discount. 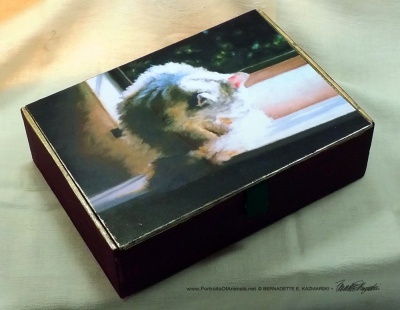 This entry was posted in animal sympathy cards, animal-inspired merchandise, cat artwork, cat greeting cards, cat merchandise, Feline Sampler Box, Sampler Box and tagged animal artwork, cat art, cat artwork, feline sampler box on July 14, 2017 by Bernadette.